DID YOU KNOW? ... 40% of heat loss is due to air leakage, per the Department of Energy? DID YOU KNOW? ... An 1/8-inch air gap along the opening of a pair of 7-foot doors is equivalent to leaving a window half open during the coldest night of the winter or the hottest day of the summer? DID YOU KNOW? ... A 1/2 inch round hole can carry as much as 50 cups of water through it over a course of a year? Increased moisture can lead to increased mold, bacteria and other health related problems. An Ice Dam is a common problem that can result in water damage to the exterior or interior of a home. 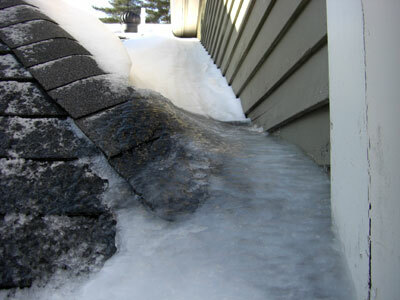 The cause of ice dams is usually warm air leaking from the living area that finds its way into the attic and roof line. The warm air from within the house melts the snow on the roof above where the air leak is located. This melting snow refreezes again once the water moves away from the warm area on the roof. If temperatures during the daytime stay below freezing long enough, the ice will begin to build up and allow water to seep underneath the shingles. As a result, there will be water damage to the interior walls and ceilings. The photos below show an ice build-up on a roof that was caused by a hole a plumber created to access pipes hidden in the wall. The hole allows warm air from the living space to seep into the attic and roof line. The infrared photos indicate the heat loss. Also, our investigation revealed a major heat loss problem that was found throughout the house. This problem was a result of improperly sealed seams that were located is some hidden areas of the drywall. The homeowner resolved both the heat loss and ice dam issues by sealing the hole and drywall seams throughout the home. 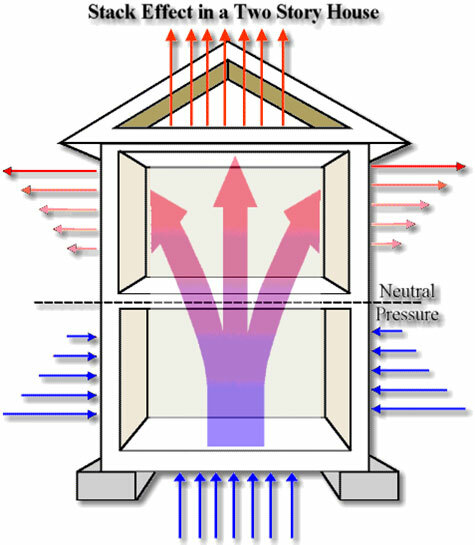 The movement of air in and out of structures, homes, buildings, chimneys, etc., is referred to as the "stack effect." This effect, also known as "the chimney effect," is driven by buoyancy. Temperature and moisture differentials create a difference in indoor-to-outdoor air density, and result in a positive or negative buoyancy force. The greater the thermal difference and the height of the structure, the greater the buoyancy force, and this creates the stack effect. The stack effect causes air infiltration in poorly sealed structures, homes, and buildings. During the heating season, the warmer indoor air rises up through the building and escapes at the top either through open windows, ventilation openings, or through leakage. The rising warm air reduces the pressure in the base of the building, forcing cold air to infiltrate through either open doors, windows, or other openings and leakage. During the cooling season, the stack effect is reversed, but is typically weaker due to lower temperature differences. Air will leak through a building envelope that is not well sealed. This leakage of air decreases the comfort of a residence by allowing moisture, cold drafts, and unwanted noise to enter and may lower indoor air quality by allowing in dust and airborne pollutants. 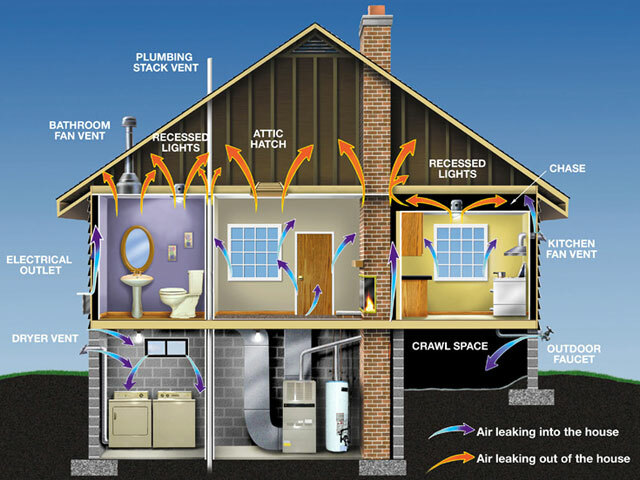 In addition, air leakage accounts for between 25 percent and 40 percent of the energy used for heating and cooling in a typical residence. The amount of air leakage in a house depends on two factors. The first is the number and size of air leakage paths through the building envelope. As shown in the figure (below), these paths include joints between building materials, gaps around doors and windows, and penetration for piping, wiring and ducts. The second factor is the difference in air pressure between the inside and outside. Pressure differences are caused by wind, indoor and outdoor temperature differences (stack effect), chimney and flue exhaust fans, equipment with exhaust fans (dryers, central vacuums) and ventilation fans (bath, kitchen). Air sealing the building envelope is one of the most critical features of an energy efficient home. To prevent air leakage, it is best to seal the building envelope during construction prior to installation of the drywall. Once covered, many air leakage paths will be more difficult and costly to access and properly seal. A "blower door" test (typically included with a Home Energy Rating) is a good way to identify air leakage paths so that they can be sealed using an appropriate material. Improved comfort. A tighter building envelope reduces the amount of unconditioned air, drafts, noise, and moisture that enter your home. Proper air sealing will also minimize temperature differences between rooms. As a result, tight envelopes can maintain a more consistent level of comfort throughout a house. Improved indoor air quality. A tighter building envelope reduces the infiltration of outdoor air pollutants, dust and radon as well as eliminating paths for insect infestation. Properly sealing the building envelope will also reduce moisture infiltration from outdoor air in humid climates. Fewer condensation problems. Condensation can lead to mold and mildew problems. In hot, humid climates, moisture can enter into wall cavities through exterior cracks and result in costly damage to framing and insulation. In cold climates, gaps in the interior walls allow moisture from warm indoor air to enter wall cavities and attics. This moisture can condense on cold surfaces and lead to structural damage. 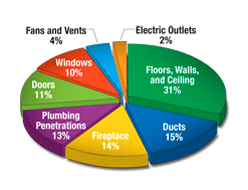 By significantly reducing air leakage, you can reduce or eliminate these problems.